I know of only two ways to cook cooking bananas--boil or deep fry in batter. I love pisang goreng (deep fried bananas fritters: very crisp and delicious but definitely not to be eaten often because of the oil) but I rarely eat them and almost never cook them. You can get pisang goreng everywhere--food court, wet markets and coffee shops and they are cheap, about RM1/US$0.25 for 6 pieces if I'm not wrong. 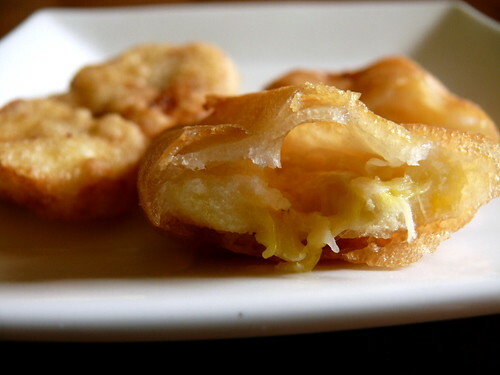 But the main reason banana fritters are bought and not home-cooked is because banana fritters are tricky to cook. 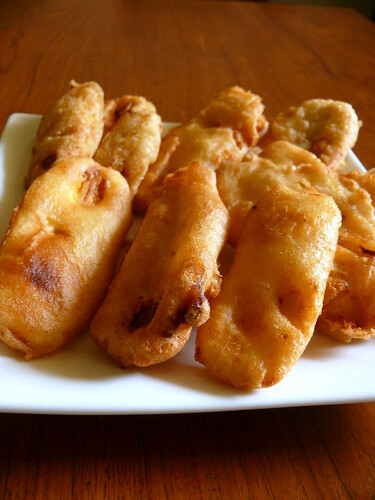 Other than having to heat up a lot of oil, it is impossible to get the results of stall-bought banana fritters which not only are light, crispy and taste great but also stay crispy for hours in our humid weather. Because we can't crack the secret recipe for banana fritters that stay crisp for long, most of us believe the rumors that plastic straws added to the hot oil is the secret ingredient that keeps the fritters crisp. Plastic straws in hot oil for making crisp fritters, onions and garlic is rumored to be widely practiced in Thailand, Malaysia and Indonesia. I find it hard to believe that people can be so unethical. I used Amy Beh's recipe (with minor changes) and fiddled around with other combinations of flours. Amy's recipe made very good and crisp fritters that were a little too smooth and fine compared to stall-bought fritters, and I personally like them that way. Kinda like fine-dining banana fritters, if they do serve these humble snacks in fine retaurants. I tested a batch of bananas using a rice flour batter and they turned out too hard and coarse. In frustration, I combined the batter from Amy's recipe with the rice flour batter and the fritters turned out the best, staying crisp longest but still not as long as those from the fritters stalls. Finally, I did what I've always wanted to do: add a straw to the oil. Maybe I didn't add enough straws to make a difference, because the fritter (I only cooked one fritter in the plastic oil, just to experiment) turned soft and soggy after a while, just like the other fritters. I'm beginning to think that the plastic straw in oil is a rumor, but that doesn't mean you should rush out and eat goreng pisang till you drop. The following recipe makes great banana fritters that stayed crispy about an hour only. 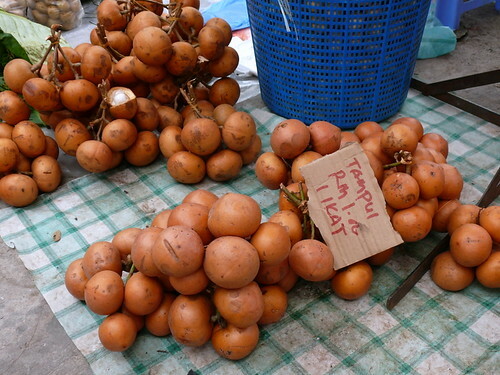 If you know of any recipe (sans plastic straws) that makes fritters like the stalls, please tell me. Of course I didn't eat the fritter cooked in plastic oil. In front, banana fritters as per recipe below and at the back, fritters using a lot of rice flour. 1. Slice the bananas into thin pieces lengthwise. 2. Mix all the batter ingredients until well-blended. 3. Heat up 4 cups of veg oil. Coat each peice of banana in the batter and slip into the hot oil, keeping heat low but hot enough to keep the oil bubbling at the edges of the fritters. If you fry at high heat, the fritters will burn and become soggy very quickly. If the heat is too low, the fritters will be heavy with oil. 4. Turn over to fry the other side. Remove when brown and drain on paper towels. The great thing about food blogging is that I get new ideas from other bloggers all the time. 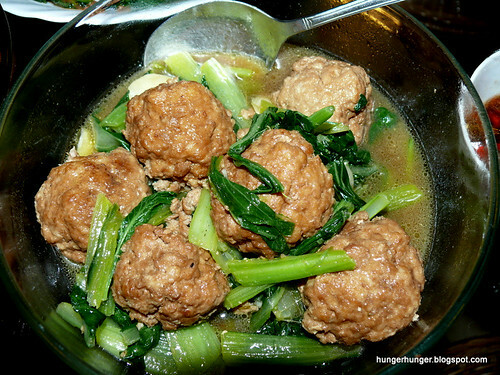 This recipe is from a reader who commented on my blog and he goes by the name 'Foodbin'. I can imagine the size of his stomach. I hope I'm wrong. I used Kraft's Jacob crackers (I couldn't find Meiji crackers, my fav) instead of marie biscuits which I imagine would give the rolls a sugary sweet taste. However, I found that the crackers didn't make the crust tastier and in fact soaked up a lot of oil so I would recommend using panko or fine breadcrumbs. The breadcrumbs would also make a crispy crust compared to the crackers crumbs which turned soggy very quickly. I also added strips of red bell peppers which I happened to have. I think you can use any meat--beef, pork or chicken. Since I was using pork loin, which is tougher than tenderloin, I cut it into thinner slices of 0.5 to 0.7 cm thick. Be adventurous. Use a variety of fillings. A soft cheese like ricotta would be good too. These little rolls, which remind me of Japanese beef rolls, are good as cocktail appetizers but beware, the crackers/breadcrumbs are like micro-sponges. 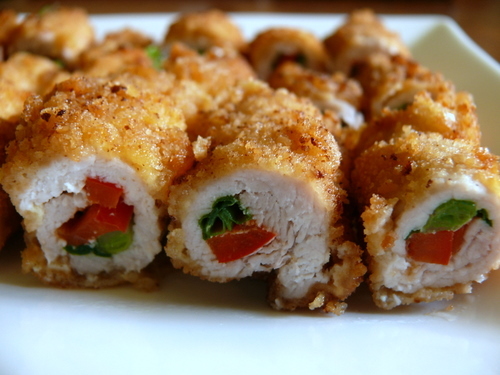 If oil is your concern, you can pan-fry the rolls with a drizzle of oil and light soy sauce instead. 1. Cut meat into 1/2 cm thick pieces. Use a mallet to hammer the meat into thinner pieces but do not break the meat through. Season the meat with salt and pepper. 2. Put a strip of bell pepper and a stalk of spring onion in the center of the piece of meat, adding more of the bell pepper and spring onion if necessary. Roll the meat up. 3. Coat the rolls lightly with cornflour, dip into the beaten egg and then into the breadcrumbs, rolling it firmly into the crumbs. At this point you can chill the rolls for 20 minutes in the fridge so that they are easier to handle during frying. 4. Heat the oil and deep-fry the rolls, 3 to 4 at a time, at medium heat. Drain on kitchen paper. 5. 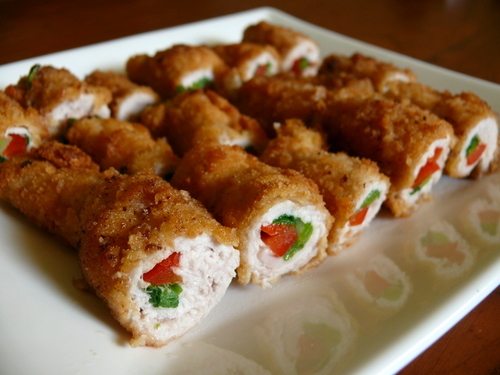 Cut rolls into maki sushi-sized pieces. Securing the pieces together with wooden skewers makes cutting easier and gives neater uniform pieces. Serve with a soy sauce-lime-chili dip. 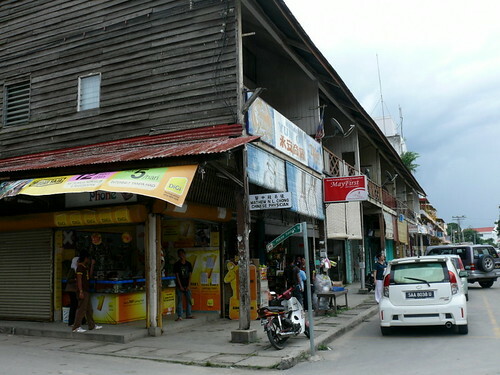 Tuaran is a small town about 30 minutes north of KK by car. When I was little, the road leading to Tuaran cut through large areas of lush green padi (rice) fields with the majestic Mt Kinabalu in beautiful shades of blue as a backdrop. Because the road to Tuaran was one of the few roads then, my Dad often drove us there on weekends because there was no where else to go. Last Saturday we found ourselves driving around with no place to go so we decided to head for Tuaran. 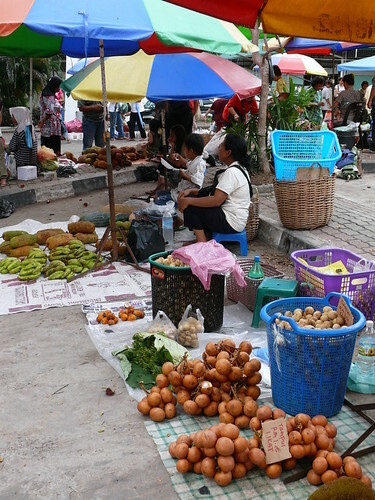 A few minutes before reaching Tuaran are stalls that sell crabs and other shellfish like mussels and clams. 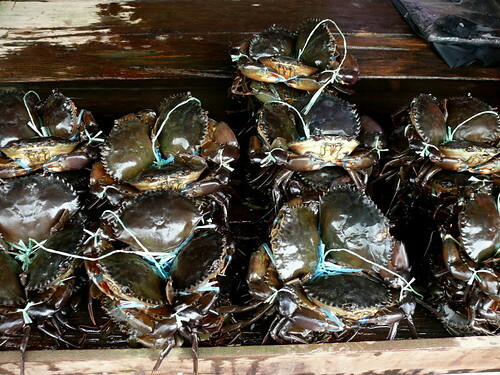 We bought 6 kgs of crabs at RM12/US$3.40 per kg, male or female. We went mostly for the female because of their roe. A word of caution: avoid the oysters because the first and last time I bought time, I had the runs even though I cooked them and a couple of them tasted foul even though they were fresh. The remaining row of wooden shoplots that was built in the 50s. I've always felt that this town has great potential as a tourist destination because it is not far from the city yet still has its small town charm with buildings that don't rise above 2 storeys. 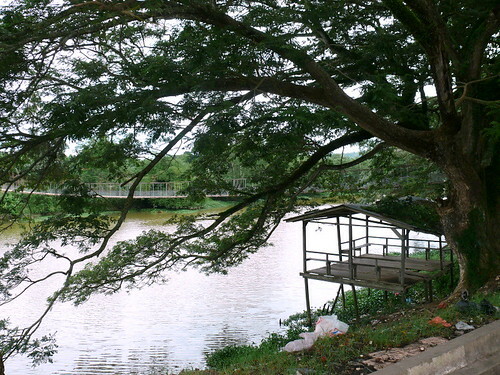 The Tuaran River runs by calmly and many of the villagers live on the other side and cross to the town via a hanging bridge. But each time I'm there, I'm horrified by the chaos and the filth. Rubbish is everywhere and drains seem to have been left out when planning the town. I don't understand why the authorities are so incompetent and complacent. The tamu was unpleasant as I had to avoid stepping into filthy puddles, and the air was real stinky. Who is in charge there? Out! This is a basket that can be slung on your back so that you can have your hands free to harvest fruits from the jungle, like these langsat.I wanted to take a photo of the young mom openly breastfeeding her kid but was afraid I'd get slugged so I turned the camera to the langsat that she was selling. 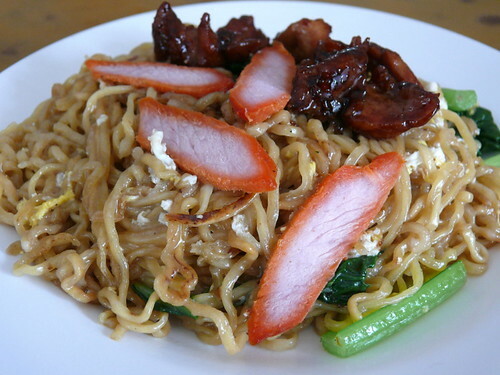 Tuaran's most famous dish is Tuaran mee, a greasy dish of fresh noodles fried with egg and topped with roasted pork. Only the special Tuaran fresh noodles nearly the size and shape of linguine qualifies the dish as authentic. 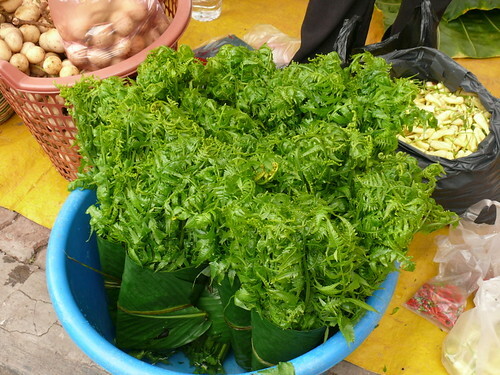 Tuaran noodles are somewhat similar to fresh wonton noodles and the Tuaran way of frying is unusual in that although the noodles are fresh, like uncooked fresh pasta, they are fried straightaway without being deep-fried or boiled. It must take some skillful cook to not fry up a plate of soggy mess. We asked some shopkeepers the best place for the noodles and were directed to Restoran Lok Kyun, behind the town library. 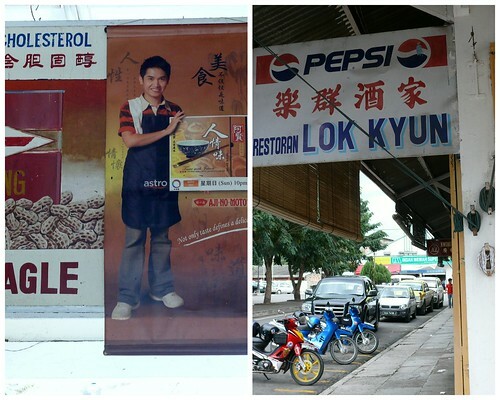 I knew we were in the right place when I saw a poster of Jason Axian of AFC on the wall. The noodles came and we waited anxiously for Wey to take a bite. He did so and immediately stuck out his thumb so I dug in too. The noodles were excellent, fried to perfection in taste and texture, not too wet or dry. The noodles were more el dente, slightly thicker than those we get in KK and the strands of noodles stayed separated, unlike most other Tuaran mee which are usually a sticky mess. I didn't like the red cha shao, which I think is Sarawakian-style, but the fried pork was very tasty and flavorsome. 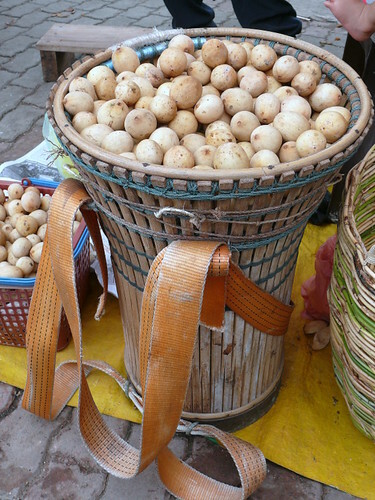 However, towards the last mouthfuls, Wey declared that he felt "jelak", a feeling that you can't eat anymore, usually brought on by eating too much oily food. I stopped eating halfway into the pile of noodles because I noticed that the bottom of the plate was shiny with oil. A couple of seconds later I felt a saltish, alkaline taste on my tongue. It didn't last very long and was quite subtle but I felt uncomfortable about it. I think it may be the alkaline water in the noodles which gives it that bite and the flavor. Still, I must say this was the best Tuaran mee that I've tasted, if only it wasn't so greasy. We also tried their wonton soup. The soup was good but the wontons hardly had any filling. At RM4/US$1.14 per plate, these noodles are worth the drive. Sorry, no new recipes. Last night we had leftovers from Tuesday's roasted lamb dinner (a small dinner for my Form 6 ex-classmates; we had a great time & again it's funny how despite not seeing each other often, we never seem to change and are so comfortable with each other), sang to a Queens VCD Ming had bought for us ("It's music from your era") and watched a whacky but entertaining movie called The Hangover (Hub as usual fell asleep). The air was cool (as it always is at night this time of the year), the coffee was good and life felt great. Thank you God. I always preferred lamb from New Zealand but this Australian lamb (using rosemary from the plant Ming smuggled in in July) was just as good, very tender and tasty. As usual, I did too many things at one time and didn't get the lamb into the oven until 5:15 pm so I roasted it at 220 C for 40 min, then at 200 C all the way through and 2 hours 40 min later, it was done to perfection. Ok, maybe it could've been a little bit less done but the bottle of red (can't remember what) from Barossa that Y bought on her recent trip was great and did the lamb justice. The corn is from my garden, the salad (still fresh after 2 days) made by Y and the leftover mushroom cottage pie was good with a bit of ground beef in it. Ming arrived home at noon, one of the first to return home from Australia for the year -end holidays. Late Nov to Feb are the fun months here, when the kids come home to party and fill up the drinking joints. With Christmas, New Year and Chinese New Year in between and final term holidays for the local schools too, it's a time to chill out not just for the kids but for us parents too. KK actually becomes young and lively. I love this time of the year when the kids come home and the family is complete. Can hardly wait until my girl comes home in 10 days. The plan was to eat out but Ming requested a Chinese meal at home with lots of veg ("The only Chinese veg they have in Coles is pak choy and chinese cabbage.") and a soup ("The only meat good for making soup is beef. 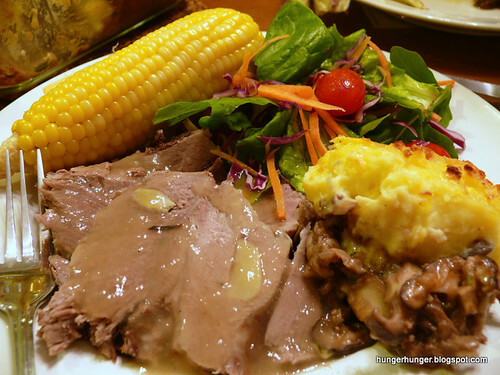 Australian chicken and pork give an awful smell to the soups.") I am lucky that my family loves home-cooked food and I am pleasantly surprised that unlike most kids here, who prefer western food, my kids love Chinese food and all kinds of cuisine. I think the trick is to make sure you cook both western and eastern food. Most kids who crave for western food probably do that out of pure craving because their moms do not cook enough western food. I know of a Chinese kid who only eats western food. I find it strange and pitiful. 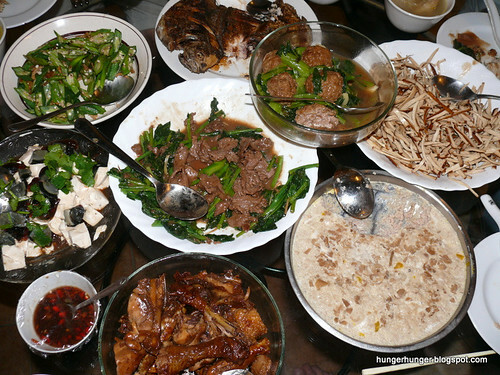 Dinner was very everyday home-cooked Chinese dishes, made with whatever was available from my fridge and garden. 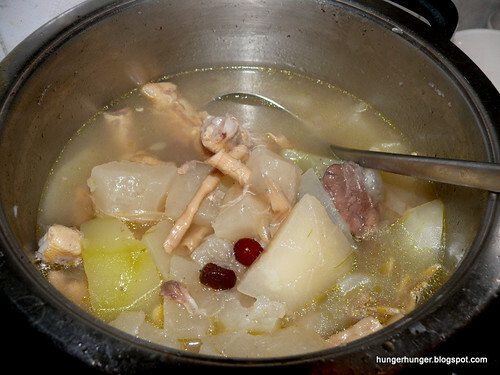 Kampung chicken with young bamboo and winter melon soup. The winter melon was from my backyard. MIL came with her Lion Heads. 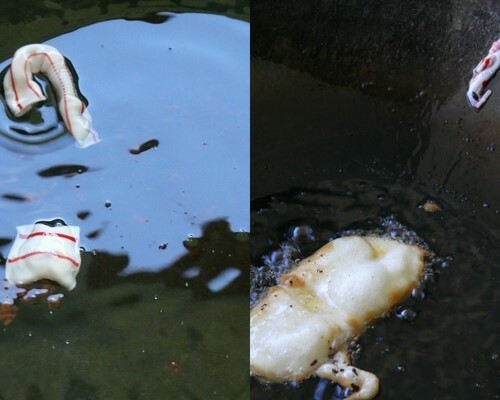 Ming wanted "the angular fish that is crispy". Lucky for me (and him), I had some stocked in my freezer. 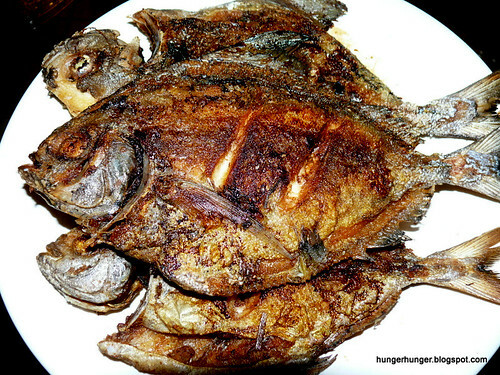 Black pomfret is heavenly when wok-fried until crispy and doused with light and dark soy sauce. 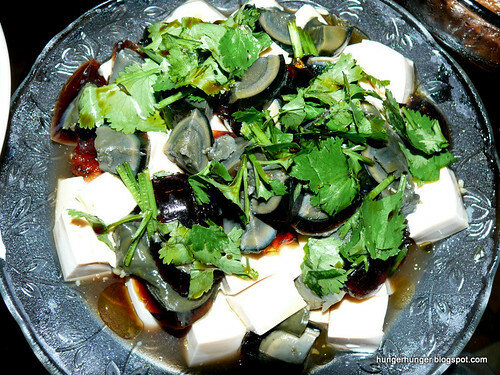 A cold dish of silken tofu and century eggs. 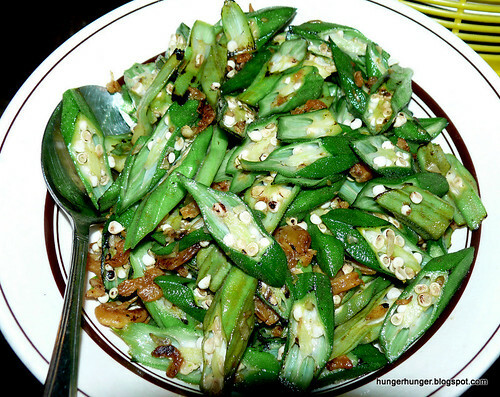 Fried okra with dried shrimps, the okra from my garden. MIL brought her soy sauce kampung chicken, a little lean but the sauce was great. Kai lan with beef fillet, the kai lan from my garden. Two more dishes were steamed minced pork with salted eggs and a veg dish of hard bean curd strips. Nothing deep-fried and lots of greens from my garden. Dessert was juicy jambu (rose apples, Ming's fav fruits) and papaya. I was surprised when he said "I miss fruits, Australia doesn't have much fruits" because most of our fruits are imported from Australia and whenever I go to Australia, I enjoy their fruits. "There's strawberries, blueberries, peaches, nectarines..." "Strawberries and all those berries aren't fruits, mom. Jambu, guava, papaya, bananas, pineapple and mangoes are fruits." Oh. I am guessing that most guys don't consider berries as fruits too. Thank you friends for the birthday wishes, messages and e-card. Yeah, I am that popular (I would like to pretend so) :D. Actually I only got 10 roses from Hub ("5 for you and 5 for your mom" he kidded. I hope he was kidding.). Why 10, I asked? He said the florist ran out of pink roses. I dunno, this guy can be pretty crafty. And 12 red ones from my lovely nieces. A nice surprise was a cake from L of Ganache fame. I was so thrilled that she remembered my birthday ("Because I read in your blog last year that you had durians instead of a cake."). L, we enjoyed the cake, especially my nieces, and they think you are the best baker in town! "Can you make it Ah Yee?" they challenged me. 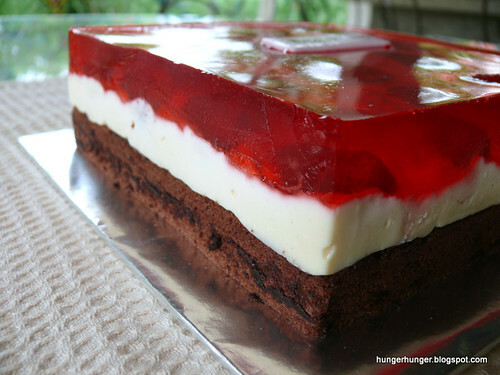 I told them I can only make the Jello layer. 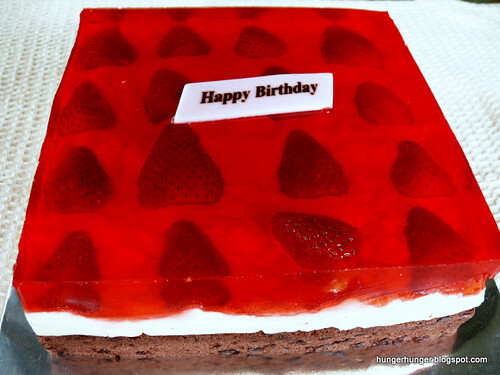 This pretty & refreshing cake tastes more like a jello dessert than a cake cake. Hop over to Ganache and make your order. 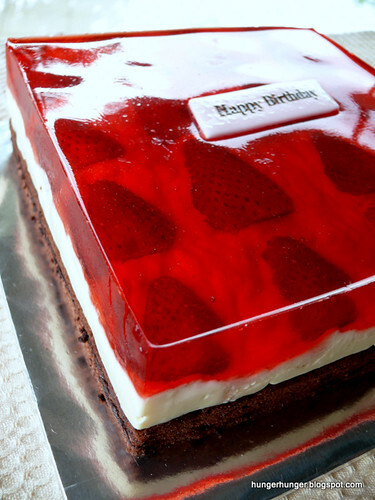 She has a long list of lovely cakes for all occasions. 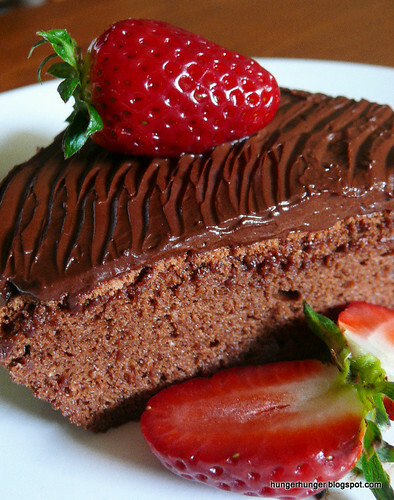 If strawberry jello is not your thing, try her banana choc cake. Heaven. 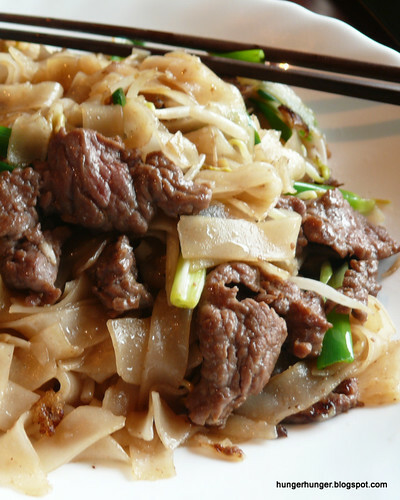 Dry-fried rice noodles with beef, a popular Cantonese dish. Gon chow ngoe ho (dry-fried noodles with beef) is the greasiest noodle dish I can think of, so greasy that I can never finish a plate by myself. 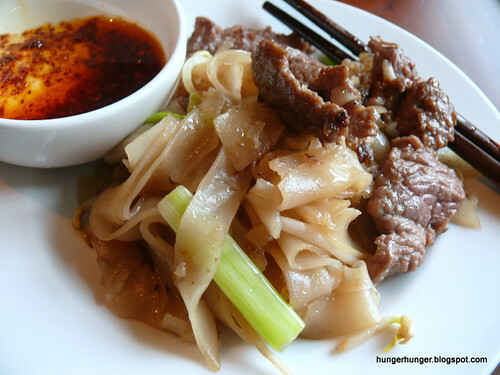 It looks simple--noodles, beef, bean sprouts and spring onions--but is one of the hardest dish to fry because the taste, flavor and texture has to be right. Too little oil and the noodles will stick to the wok. I always end up with this situation because it's hard for me to use so much oil when the noodles already come coated with oil. Too much oil and the noodles can swim in oil and this is usually the case, even in Hong Kong. Cooking with a non-stick wok just doesn't give the same flavor as an old-fashioned iron wok fired until it is red hot. The noodles have to taste of wok hei (heat of the wok, a smoky flavor) yet not be charred like char kwey teow. This means the heat has to be intense and your hands have to work quickly to make sure the noodles are well-fried and not burnt or broken up. The noodles have to be evenly coated with the simple seasoning of soy sauce so that every bite is uniformly tasty and flavorful. The simple seasoning means that the soy sauce can make or spoil the dish. The noodles should be an even golden color, not black like char kwey teow. Finally, when you eat the GCNH, it has to make you marvel at the cook's skills and your incredible luck to eat such a well-fried dish. I figured that the most important thing in frying GCNH is to fry the noodles in individual portions so that the heat is kept high and the noodles are well tossed around in the wok. The wok has to be sufficiently big too or with all that frenzied frying, half the noodles could fly out the wok. Like I said, I wouldn't attempt this dish if I could eat it in a restaurant but I'm not in Hong Kong, Guangzhou or Canada. Canada gets a special mention because that's where I ate many plates of excellent GCNH , a dish Hong Kong students never fail to order. I had a Hong Kong roomie the first year and our fav orders were pizza, GCNH and Singapore fried noodles (which isn't truly Singaporean but North American-Chinese). In the middle of a -30 C night, nothing tastes as special as food delivered to your door. Canada was the favorite country of choice for migration for Hong Kongers which explains why this popular Cantonese dish is cooked to perfection there. A good plate of GCNH depends not only on frying skills but also on the soy sauce and most restaurants have their own secret house blend. I used Yummy House's premium soy sauce but was disappointed that my noodles weren't golden like the ones in Hong Kong. Oyster sauce is not authentic to GCNH but I've added it in place of msg. And if you go to all that trouble to cook GCNH, make sure you serve chili oil sauce with it just like they do in Hong Kong and Guangzhou. Attempt this dish only if your local restaurants don't serve it. 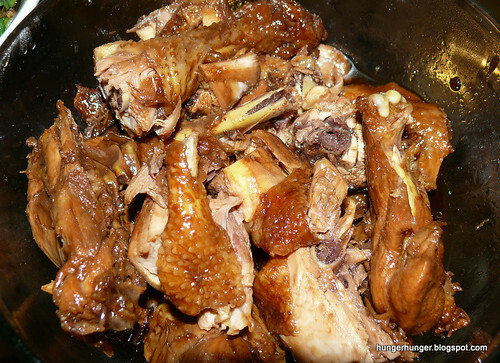 sauce: Mix 2 T oyster sauce, 1 1/2 T light soy sauce & 1 T water/stock OR 2 T light soy sauce, 1 t chicken powder and 1 T water/ stock. 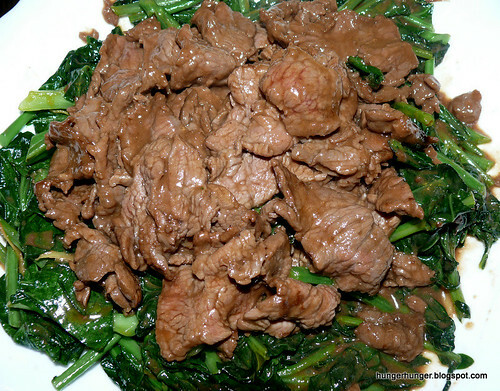 * Slice the beef slightly thicker than for the usual stir-frying, about 0.4 cm thick. **In Chinese cooking, beef is often marinaded with bicarb of soda to tenderize it and to make it swell into thicker slices. However, much of the flavor is lost so you may want to leave the bicarb out. Prep: Mix the sliced beef with all except the last ingredient, kneading with your hands to mix evenly. Lastly, add the oil and leave for at least 1/2 hour. Loosen the noodles with your hands, separating the strands so that they can be fried evenly. 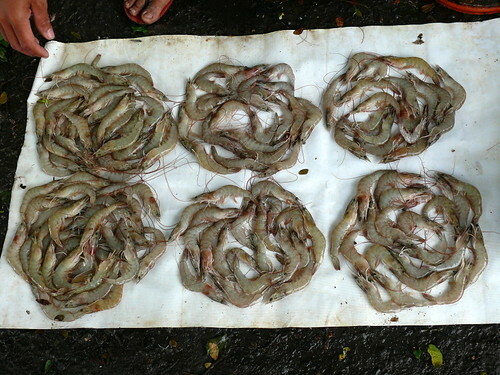 Blot excess oil with kitchen paper. If you use chilled fresh noodles (like I did), they will break easily when you fry them so do try to use unchilled fresh noodles. 1) Put 3 T peanut oil into a hot wok, add the beef in a single layer and let it fry at high heat for about 15 seconds, then turn over, keeping the beef spread out in a layer. When beef is about 80% done, push to the side of the wok or dish onto a plate. You can also add the beansprouts and scallions now, plus a pinch of salt, and fry with the beef. This makes it easier to fry the noodles alone later. 2) When the wok is beginning to smoke (there will still be oil from frying the beef. If not, add a tablespoon of oil) throw in the sauce and let it bubble for a couple of seconds to develop the flavor, add the noodles and toss well so that every strand of noodles gets coated with the sauce. If the scallions and beansprouts were not added earlier, add them now and toss quickly. A frying ladle in one hand and a pair of chopsticks in the other can make it easier. Add the beef if you've removed it from the wok. If beef is at the side of the wok, push it back to mix with the noodles. 3) Dish onto a plate and pray that all your effort is not naught. Serve with chili oil sauce. Nearly flourless choc cake. I love these strawberries from New Zealand. They very sweet, full of flavor, deep red in color and almost seedless. Just like me, when E gets her hair done in the salons, she'd write down recipes from magazines. But unlike me, E actually tries those recipes out and this cake comes to you by courtesy of E. The recipe is from a lady who got it from her mother who got it from her French mother. I think it's an almond-less version of the Queen of Sheba, a rich French chocolate cake. Instead of ground almond, only two tablespoon of plain flour is added. Since 'French Chocolate Cake' is too ordinary, I've renamed the cake to reflect its distinctness. This chocolate cake is light and moist so you'd need to bake a huge one to satisfy the family. Despite the scant bit of flour, the cake doesn't taste like an airy mousse. Of course for something so simple, you'll need the best chocolate your money can buy. Top the cake with a rich ganache or whipped fresh cream and some fresh fruits, and you've got a dessert good enough for Anton Ego to swallow. 1. Set oven at 190 C, put water into the oven tray upto a level of 1 cm. Grease and line bottom of a 22 cm springform pan. 2. 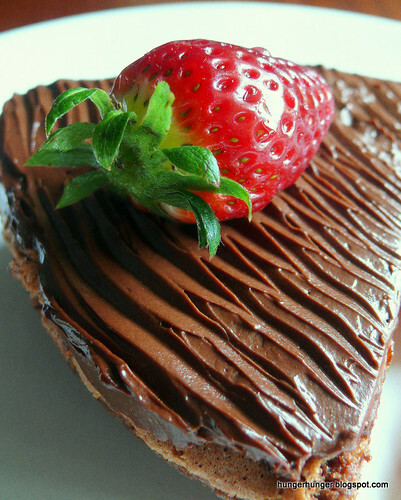 Melt butter & choc in oven at low heat or over a basin of boiling water. Cool. 3. Transfer choc to a bowl, add sugar, flour and egg yolks. 4. In another bowl, beat the egg whites until soft peaks and fold it through the choc mixture until blended. 5. Spoon into the prepared pan and bake bain marie for 30 minutes. Cool and serve.